Randal Birkey was commissioned to produce a series of architectural illustrations of the renovation project of “Symphony Center,” the home of the world renowned Chicago Symphony Orchestra. Orchestra Hall, as it is also known, was undergoing an extensive renovation, as well as being connected to another building around the corner from Michigan Avenue. Together, this new combined complex was to be called “Symphony Center,” and would house not only the auditorium, but also all the practice rooms, backstage production and staging areas, and the headquarter offices for the organization. This illustration was produced by Randal working from the architectural blueprints, in a Mac-based 3D perspective wireframe application. Once the view and level of line detail were reached, the line work was transferred to a 2D drawing program called Fractal Painter. In the Painter software, all the watercolor and color pencil texturing was added. A Wacom tablet was required for the kind of control needed for the digital “brushes.” The application and tablet ran on an Apple Macintosh computer. 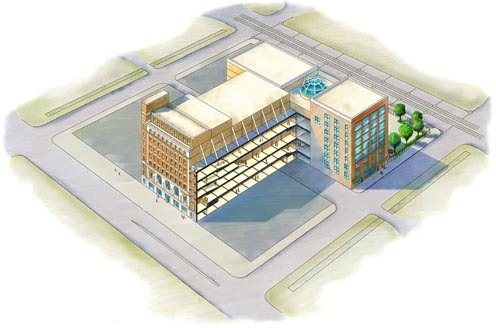 Additional illustrations were completed including a cutaway elevation, lobby view, floor plan, and auditorium views. These illustrations were all used in a high-end printed piece that went to CSO supporters to communicate the renovation project details, and also as a fund-raising tool.